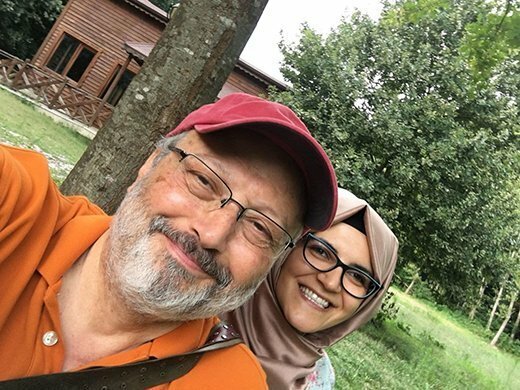 Jamal Khashoggi in a selfie with fiancee Hatice Cengiz at his home in suburban Virginia, outside Washington, D.C.
here are times when events and images conspire to become etched in our hearts and minds. One for me came on a night when I was acting in my first Shakespeare play, “Much Ado About Nothing.” The theater was packed and it was that tense moment in the play when, playing Friar Francis, I had the complete attention of the audience and all the actors onstage. I paused to look around to take it all in. Time stood still; five seconds of eternity that I’ve never forgotten. I have other wonderful earlier memories. The clanging bells of the Good Humor ice cream truck rounding the corner on a spring afternoon, my grandfather teaching me how to clean a fish, seeing my wife for the first time, my son’s wedding, the Apollo 11 moon landing. There have also been darker moments, typically associated with death. Losing a dear brother-in-law far too young, the shooting of my dog Tadich, a Gordon Setter, by a neighbor, the 1986 Challenger space shuttle exploding, the Twin Towers collapsing. This president has regularly affronted American values, but this particular affront stood out more. It was an act that is likely to indelibly stain how American politics views human rights in the future. I find myself recalling all these more alarming events in the aftermath of the murder of Saudi journalist Jamal Khashoggi, particularly in the context of recent remarks by President Donald Trump. On Nov. 20, notwithstanding CIA findings that Saudi Crown Prince Mohammed bin Salman had ordered the brutal murder of Khashoggi, a legal U.S. resident, Trump said that the United States would stand with Saudi Arabia because of its economic importance, in essence putting expediency ahead of any established concept of national and international morality. As explained in political philosopher Michael Sandel’s book “Justice,” Aristotle believed that politics existed to enable all individuals to develop their distinctive human capacities and virtues, to share in self-government, and care for the fate of the community as a whole. Politics is not only about protecting property, promoting economic prosperity or even carrying out the preferences of the majority. Similarly, he believed that leaders should be chosen not simply because they would enact wise policies but to honor and reward their civic virtues. The president’s renunciation of his responsibility as Commander-in-Chief to protect American citizens and those legally present in the U.S. — Khashoggi worked in Washington at the time of his abduction and killing in Istanbul — was the clearest evidence yet that he lacks any sense of civic virtue. His genuflection before the dollar was an attempted assassination of respect for human rights, a principle value in American life. The president’s turning his back on Khashoggi’s fate was tantamount to looking away from the assassinations of Dr. Martin Luther King, John and Robert Kennedy, and John Lennon – all leaders with defiant political messages. Khashoggi was also defiant, but he was treated as an outlier. Aristotle also posited that nature does nothing in vain. We have the capacity to speak. To live the good life, we must use that gift to affirm what is just and what is not. Now is a time when Americans must actively work to defend the value of human rights it has long stood for. It is a time when checking out is not an option.